This fine example of an itinerant mesmerist’s tools of the trade was found intact during my first visit to the building housing the Museum of Mesmerism in Bzinica Stara. 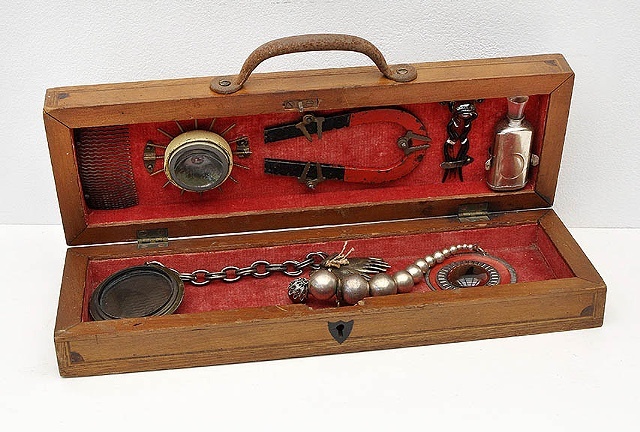 The kit includes 2 hypnotic pendulums, some magnetism devices, a miniature vision ball, a small vial of aromatic spirits, and a rare find: a “vision-spinner” used for quickly shifting focus from a normal plane of reality to a parallel plane. The toolkit belonged to my great-great uncle Rafal, who traveled often around Europe practicing his mesmeric arts.